Surface studied by Listing and Möbius in 1858. August Ferdinand Möbius (1790-1868): German astronomer and mathematician. 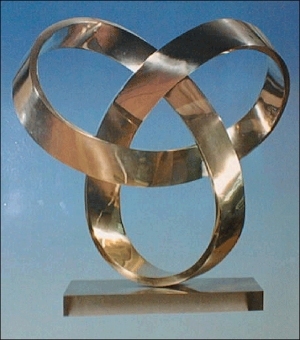 Other name: Möbius (or Moebius) band, ring, belt. 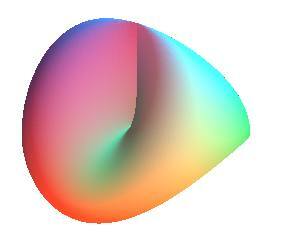 Rotoidal representation: see Möbius surface. Wunderlich representation: surface envelope of the rectifying planes (i.e. the rectifying developable) of the rational curve: with . 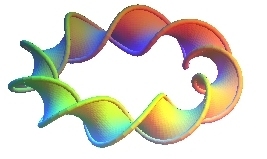 A Möbius strip is a surface obtained by sewing together two sides of a rectangular strip with a half-twist, or any topologically equivalent surface. Maple program giving an animation of the opposite construction. the boundary of the strip with 2p + 1 half-twists is a toroidal knot of order (2p + 1, 2). The Möbius-Wunderlich strip has the property that it develops into a rectangle and it minimizes at all points the strain energy. Left-handed strip with one half-twist: the radius of one of the cylinders is equal to twice that of the other ones and the planar sections are parallel. Right-handed strip with 3 half-twists. 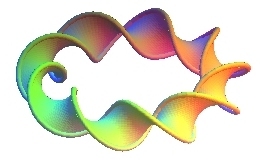 Here are two other developable Möbius strips obtained by putting strips cut on cones next to one another. 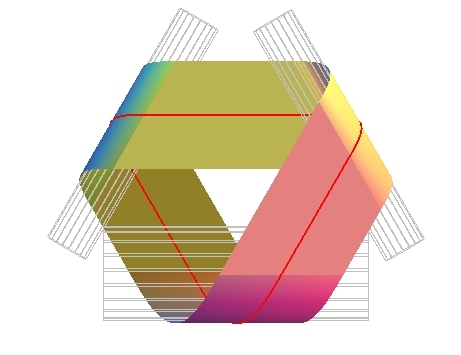 The blue and green strips are cut on cones of revolution; the red strip on two cones of revolution; the pattern is unfortunately not a rectangle, but a parallelogram, hence the connection with a right angle. 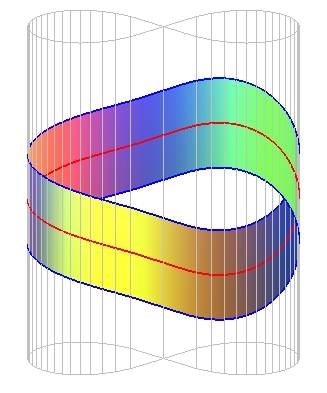 This is a Möbius strip with 3 half-twists instead of 1, obtained thanks to 3 conical strips, the directrix of the cones being Viviani's curve. The boundary is self-parallel, but the pattern does not have linear edges. 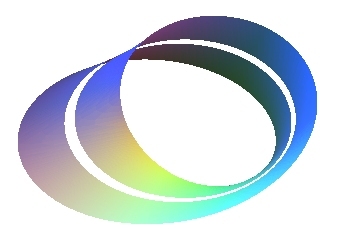 This strip with two half-twists (which is, therefore, not a Möbius strip) is developable since it is traced on a cylinder based on a lemniscate. Its pattern does not have linear edges, but our eyes tend to think so, hence our tendency to consider this figure to be impossible! 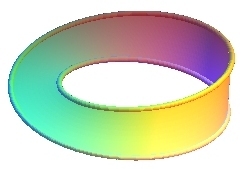 Here is already a Möbius strip with one half-twist for which the ratio length/width is equal to 3Ö3 (slightly greater in fact for the sake of clarity). The view from above is a regular hexagon. The initial pattern is indicated on the right (the 3 folds are dotted). 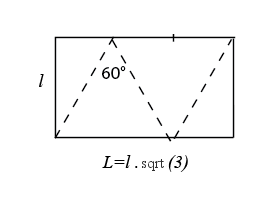 But with a rectangle for which the ratio length/width is equal to Ö3, you will construct a Möbius strip for which the view from above is an equilateral triangle. The same one, tightened (almost) as much as possible: Length of the strip equal to 3Ö3 times the width. It cannot be tightened more without self-intersections. Length of the strip equal to 4 times the width. The same one, tightened (almost) as much as possible: Length of the strip equal to times the width. Length of the strip equal to times the width. 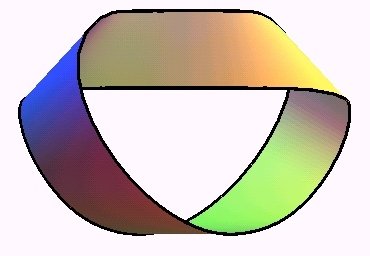 Therefore, except in the case n = 3, the Möbius strip with n half-twists tightened as much as possible, with circumference a regular n-gon, needs a rectangle (alternating folds hollow/bump). 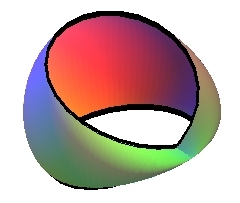 Just as the Klein bottle cannot be represented in without self-intersections, the Möbius strip cannot be represented in the plane without self-intersections. 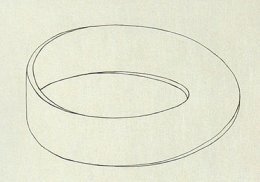 The Möbius strip is a surface that can be characterized by the fact that it has only one face (in other words, it is one-sided, hence non-orientable), a unique boundary and its genus is equal to 1 (i.e. a closed curve traced inside it can leave it connected, but not two curves). 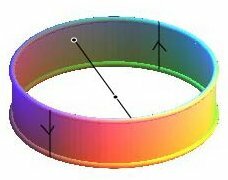 We also get a topological Möbius strip by identification of the opposite sides of a rectangle with an inversion of direction. The oriented segment line [A1 B1] is identified to [A2 B2], so that there is only one boundary [A1 B2] linked to [A2 B1]. 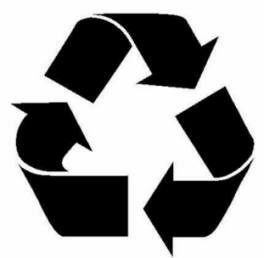 In the real strip, A1 = A2 =A and B1 = B2 = B. 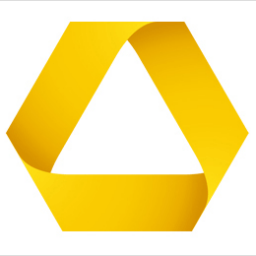 ...the we get a less classic triangular representation of the Möbius strip. Here, the oriented segment line [J1 J2] is identified to [J3 J1], so that the 3 points J1, J2, J3 are identified. Here, it is easier to see the unique boundary. 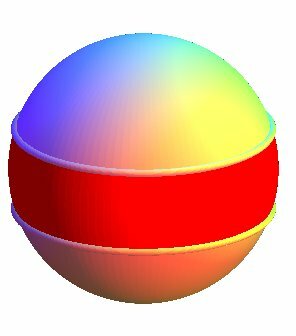 Consider the sphere where the antipodal points are identified, i.e. a real projective plane. Then, a strip located between to tropics is a Möbius strip. 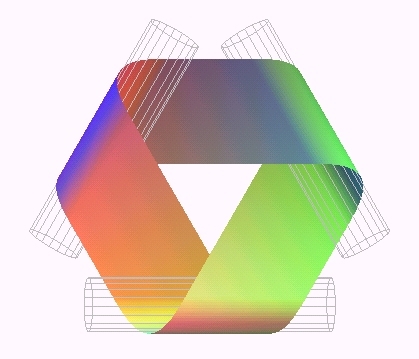 The complement is an open disk. 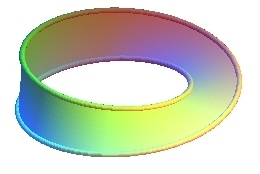 The Möbius strip can therefore be obtained by puncturing an open hole into a projective plane. 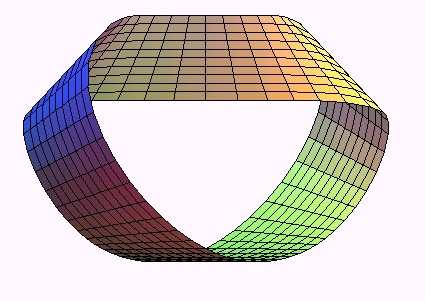 The chromatic number of the Möbius strip is therefore equal to that of the projective plane, i.e. 6. In this map with 6 countries traced on a Möbius strip, each country meets the 5 others; 6 is the maximum number possible, and any map can be colored with no more than 6 colors. 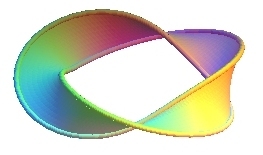 When two Möbius strips are sewed together by their boundaries, we get the connected sum of two real projective planes, i.e. a Klein bottle. The Möbius strip without its boundary is called the open Möbius strip; it is homeomorphic to the projective plane minus one point. 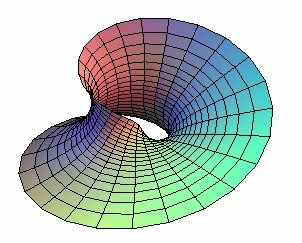 See also the boundary of the Möbius strip with 3 half-twists, which is a trefoil knot and the fake Möbius strip on the torus. this way he gets only one strip, knotted like a trefoil knot, with 6 half-twists. 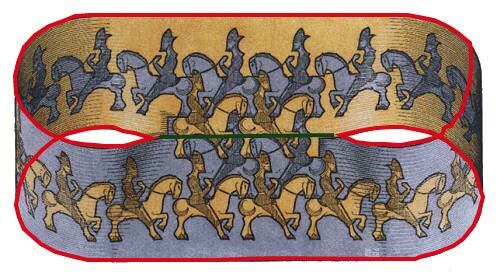 Escher's famous horsemen are represented on a strip with two half-twists, hence with two faces (colored in grey and beige) and two boundaries, but the central fusion that simulates the identification between two segment lines of each boundary (indicated in green) makes it a topological Möbius strip with only one face, and only one boundary, indicated in red (cf. 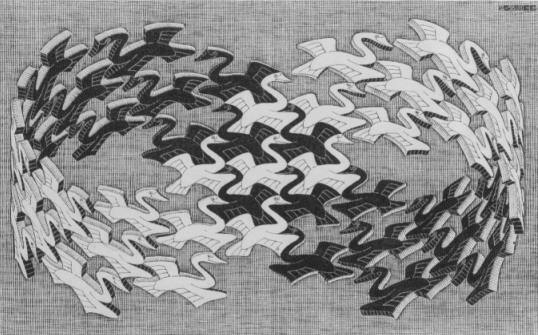 Möbius shorts) Same principle for these swans with black-and-white faces. 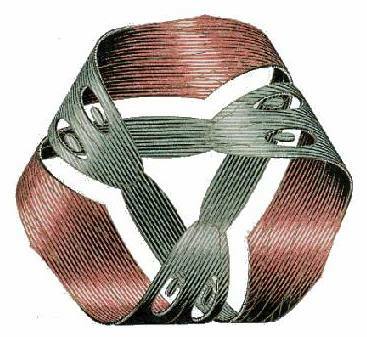 Möbius strip braided with only one braid by Juan Pablo Baudry Möbius strip with 3 half-twists knotted as a trefoil knot. Logo of the Swiss institute of intellectual property, the title of which is written in the four national languages. 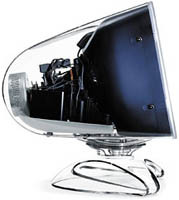 The logo of Renault is a strip with two half-twists, and therefore is not a Möbius strip Also look at the foot of this Apple monitor!